Two botanical studies of Banksia seed pods. Figure 1 an undetermined Banksia. Figure 2 the rock hakea Hakeas gibbosa [here termed Banksia gibbosa].The plants are native to Australia and were named after Sir Joseph Banks. Plate 22 from Journal of a voyage to New South Wales...by John White (J.Debrett, London, 1790). 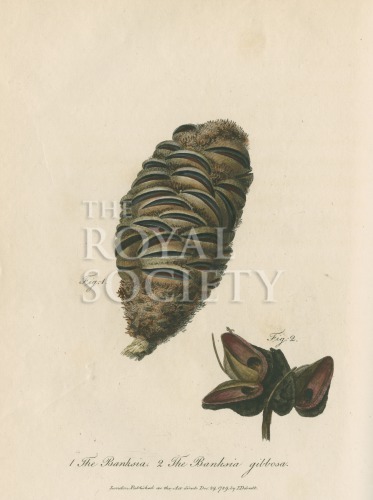 The accompanying text states of figure 1 that it: “represents the capsule of another Banksia, belonging to those which bear the flowers in spikes, but we cannot with certainty determine the species.”.